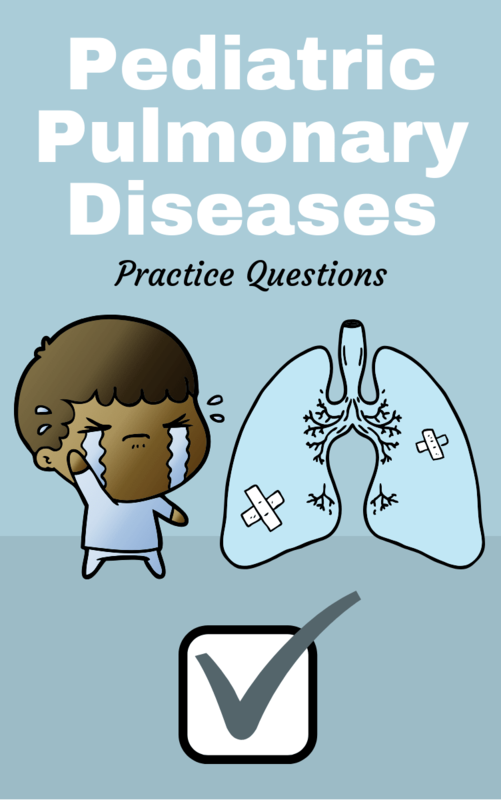 Are you looking for information about Pediatric Pulmonary Diseases? If so, then you’ve come to the right place. We created this study guide to help you ace your exams in Respiratory Therapy school on the topics that cover all the pediatric pulmonary diseases. These practice questions can help you learn everything you need to know. Are you ready to get started? 1. What accounts for the fact that a small airway obstruction usually doesn’t cause symptoms in older children and adults but does in small children? The airway resistance is more evenly distributed in young children such that the bronchioles make up 50% of the resistance in children compared to 10% in adults. 3. Bronchiolitis is what type of condition in adults? What about in children? It is acute in children and chronic in adults. 4. What are the most common etiologic agents to cause acute infectious bronchiolitis? Respiratory Syncytial Virus (RSV) which is the most common, influenza, parainfluenza, adenovirus, metapneumovirus (HMV), and mycoplasma pneumoniae. 5. What is the leading cause of hospitalizations in infants under 1 year of age? RSV, lower respiratory tract infection. 6. What is the pathogenesis of the RSV infection? RNA virus infects epithelial cells lining respiratory tract, entering through the nasal or conjunctival mucosa. Infection in the upper airway, which leads to aspiration into the lower respiratory tract. Reproduction of virus in epithelial cells and release when cell is lysed or dies. Increased mucus production & bronchiole lumen becomes filled w/ infected secretions and cellular debris. 7. What are the clinical and physiological features of the RSV infection in children? Profuse rhinorrhea w/ thin clear secretion, prominent cough, tachypnea w/ accessory muscle use, crackles and wheezing, central apnea, hypoxemia from V/Q mismatch, and increased interstitial markings on the radiograph. 8. When would you hospitalize an infant with RSV infection? If there is a significant oxyhemoglobin desaturation or frank cyanosis, tachypnea leading to inability to drink, and high amounts of distress. 9. In what context does bronchopulmonary dysplasia occur? Survivors of respiratory distress syndrome; often those who were exposed to ventilator-induced volutrauma, barotrauma, and oxidant injury. 10. What is the most common reason for rehospitalization in infants with BPD? 11. What causes neonatal respiratory distress syndrome? Inadequate surfactant levels that causes a collapse of alveolar air sacs and formation of hyaline membranes. 12. What is used to screen for lung maturity in infants? Amniotic fluid lecithin to sphingomyelin ratio. 13. What lecithin sphingomyelin ratio indicates adequate surfactant production? 14. What are three factors that neonatal respiratory distress syndrome is associated with? Prematurity (lack of surfactant), Caesarian section delivery (lack of stress-induced steroids), and Maternal diabetes (insulin decreases surfactant production). 15. What are the clinical features of neonatal respiratory distress syndrome (NRDS)? 16. What is the x-ray finding associated with neonatal respiratory distress syndrome? Diffuse granularity of the lung with ‘ground-glass’ appearance. 17. What is the treatment of neonatal respiratory distress syndrome? Mother is given steroids before birth, while the infant is given artificial surfactant. 18. What are the results of a free radical injury due to supplemental oxygen in neonatal respiratory distress syndrome? Retinal damage that may result in blindness, intraventricular hemorrhage, and lung damage that may cause bronchopulmonary dysplasia. 19. What is the result of hypoxemia in neonatal respiratory distress syndrome? Metabolic acidosis, increased risk for persistence of PDA, and necrotizing enterocolitis. 20. What is the initial neonatal screen for CF? Screen for increased concentrations of immunoreactive trypsinogen (IRT). 21. What is vocal cord dysfunction and how it is different from asthma? Defined as an involuntary closure of the vocal cords and typically occurs during exercise. Postnasal drop and reflux can contribute. Fairly sudden onset of shortness of breath with exercise that resolves quickly. Standard asthma therapies do not help. Flexible laryngoscopy can confirm the diagnosis. 22. What embryonal layer gives rise to the lung bud and when does this occur? Foregut endoderm on week 4. 23. What are the 3 main stages of embryonal respiratory development? Pseudo glandular (week 4-16), canalicular (week 16-25), and alveolar (week 26-28). 24. In embryonal development, when is airway branching complete? Week 16 (pseudo glandular stage). 25. In embryonal development, when do mucus glands begin to appear? Week 8 (pseudo glandular stage). 26. In embryonal development, when do cilia appear in the large airways? Week 10 (pseudo glandular stage). 27. In embryonal development, when do goblet cells appear? Week 13 (pseudo glandular stage). 28. In embryonal development, when do serous glands begin to appear? Week 26 (pseudo glandular stage). 29. What is the most important development during the canalicular stage of respiratory embryology? The formation of the alveolar ducts and air sacs lined with cuboidal cells (precursors to type 1 and type 2 alveolar cells) in relation to capillaries. Lines the alveoli and decreases surface tension. 31. What role does surfactant play at birth? It prevents the collapse of alveoli on exhalation. 32. Which agents increase the rate of lung maturation? Cortisone, stress, thyroxine, prolactin, theophylline, and sympathomimetics. 33. Which agents decrease the rate of lung maturation? Insulin, metyrapone (steroid antagonist), and barbiturates. 34. What clinical features might an infant with a tracheoesophageal fistula present with? Feeding difficulties, coughing with feeding, and aspiration of feedings into airways (PNA). 35. A patient is found to have an absent lung or lung lobe. When did the insult to development occur? 36. Why is surgical removal of bronchogenic cysts a relatively easy procedure? Cysts supplied by pulmonary circulation which is low pressure and no problems with bleeding. 37. What are lung sequestrations? 38. In which type of congenital lung malformation is surgical correction difficult and why? Sequestrations because of systemic blood supply. 39. The incidence of NRDS is high in infants born at what time? 26-30 weeks (and with low birth weight). 40. How may an infant with NRDS present at birth? Cyanotic, tachypneic, grunting nasal flaring, and chest wall retractions. 41. What is the definition of Sudden Infant Death Syndrome? The sudden death of an infant or young child unexpected by history and unexplained by post-mortem evaluation. 42. What are some maternal risk factors for SIDS? Intrauterine hypoxia, fetal growth retardation, UTI, smoking, anemia, cocaine/heroin use, nutritional deficiency, less prenatal care, lower SES, young maternal age, increased placental weight, and increased parity. 43. What post-natal precautions can be done to prevent SIDS? By putting the baby on their back (supine), no pillows or soft mattresses, no bumper pads, breastfeeding, and baby in parent’s room (not bed). 44. What are the clinical manifestations of CF? GI: pancreatic insufficiency, Respiratory: recurrent infections, obstructive lung disease, bronchiectasis, and Repro: Infertility in males. 45. What are the clinical manifestations of Kartagener’s syndrome? Recurrent upper and lower respiratory infections (sinusitis, otitis media, bronchitis, bronchiectasis, PNA), situs inversus, and immotile sperm flagella. 46. What is primary ciliary dyskinesia (PCD)? Disorder of the cilia lining in the respiratory tract, spermatozoa, fallopian tubes, and male vas deferens. 47. What causes impaired mucociliary clearance? Cilia structural abnormalities and disordered motility. 48. What is associated with PCD? Situs inversus, bronchiectasis, and sinusitis. 49. What is the clinical diagnosis of PCD? Loose sounding cough, persistent cough and bronchitis, recurrent ear infections, recurrent pneumonia, situs inversus, male infertility, and imaging of lung and sinuses. 50. What is the inheritance pattern of PCD? Autosomal recessive and rare families show autosomal dominant or X-linked. 51. What does the normal cilia structure contain? Outer dynein arm, radial spokes, inner dynein arm, and micro-tubular pairs. 52. What is Kartagener syndrome? It is secondary to PCD and situs inversus. Caused by a combination of situs inversus, chronic sinusitis, and bronchiectasis. Similar symptoms to PCD. Also, autosomal recessive. 53. What is the definitive diagnosis for PCD? 54. What are the genes involved in PCD? DNAI1, DNA12, and DNAH5 have situs inversus due to lack of ODA. DNAH11 causes situs inversus but has normal cilia structure. 55. What is a congenital diaphragmatic hernia (CDH)? It is the failure of the closure of the diaphragm at 8-10 weeks which is followed by herniation of viscera into usually the left side of the chest. 56. How is CDH diagnosed? 57. What is the most common diaphragm defect in CDH? 58. How is CDH treated? Prenatal transfer to a tertiary care center for delivery and to determine the time for surgery. 59. What is the genetic basis of CDH? Duplication and deletion mutants in 15q26 & 8p23.1. 60. What syndrome is associated with CDH? 61. What is the inheritance and clinical presentation of Fryns? Autosomal recessive and patients have hypoplasia and craniofacial abnormalities. 62. What is Congenital Central Hypoventilation Syndrome (CCHS)? Failure of autonomic control of breathing. Ventilation is severely affected during sleep. 63. What is the CCHS presentation? No arousal or distress, severe hypoxemia and hypercarbia, cyanotic and low heart rate. 64. How to diagnose CCHS? Notice poor breathing effort during sleep hypoventilation. Use a detailed sleep study. 65. What is the treatment for CCHS? 66. What percentage of pediatric pulmonary diseases account for DEATHS in children younger than 1 year of age? 67. What percentage of pediatric pulmonary diseases cause HOSPITALIZATION in children younger than 15 years of age? 68. What percentage of children have a chronic disorder of the lower respiratory system? 69. How is an infant’s airway and respiratory system different from an adult? The chest wall is more compliant, they rely more on the diaphragm, their lungs are smaller with fewer alveoli, and they have a small and easily collapsible airway. 70. In general, infants are what type of breathers? They are obligate nose breathers. 71. 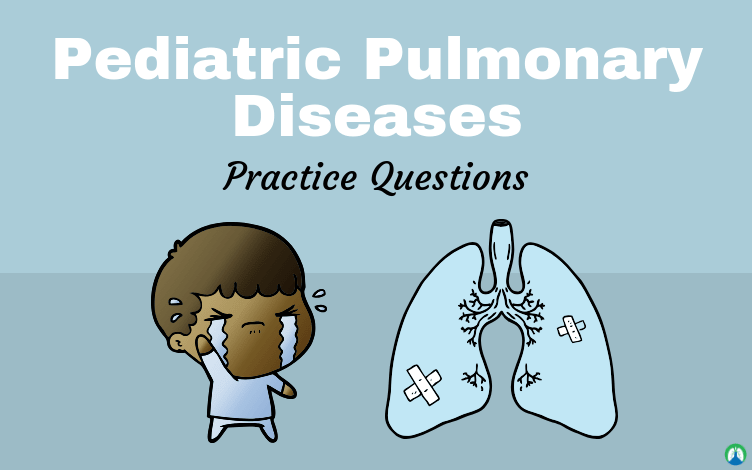 How are pediatric pulmonary problems different than adults? Pediatric patients will typically present with pulmonary problems the younger they are (as opposed to how older adults will have the most pulmonary problems). Pediatric patients will have a smaller airway and compliant thoracic cage. This will help us to see them breathing hard or not at all. Pediatric patients have less energy stores, so they will present with fatigue faster than adults. The younger the child, the more breaths they will take every minute. Neonates will take up to 60 breaths per minute. 72. What are the 5 characteristics of kids which make them more susceptible to pulmonary diseases? Smaller airways put objects in mouth, immature immune system, attend daycares/schools (germ factories), and rejection of vaccination by parents. 73. What kind of conditions do the smaller airways of children make them susceptible to? Inflammation and upper respiratory tract infections. 74. What is the reason for kids to have a higher risk of aspiration? They stick stuff in mouth. 75. What are the child disorders of the upper airway? Croup, Spasmodic croup, Acute epiglottis, Tonsil infections, Aspiration of foreign objects, and Obstructive sleep apnea syndrome. 76. What are the 3 levels of heart defects? 77. What are 5 risk factors of newborns with transient tachypnea? C-section, macrosomia, males, maternal asthma, and maternal diabetes. 78. What are the 3 risk factors of asthma? Low birth weight, bronchopulmonary dysplasia, and respiratory syncytial virus. 79. What are 3 common findings in children with CP? High chest flattened anterior rib cage, and excessive rib flaring. Also known as acute laryngotracheobronchitis. It is common in children from 6 months to 5 years, commonly caused by a virus (parainfluenza, influenza A or RSV (85%) – causes subglottic edema. 81. What is acute epiglottitis? Severe, rapidly progressive, life threatening infection of the epiglottitis and surrounding area. Historically caused by Haemophilus influenzae type B – 80%-90% decreased incidence due to HIB vaccination. 82. What are the symptoms of RDS in a newborn? Tachypnea, expiratory grunting, nasal flaring, and dusky (cyanotic) skin. So there you have it! That wraps up our study guide on the Pediatric Pulmonary Diseases. I hope that you can use the practice questions to truly learn and understand the information that is required of you. I know that if you do, you’ll be well on your way to acing your exams and becoming a Respiratory Therapist is no time. Thank you so much for reading and as always, breathe easy my friend.